The sports camera is a high-definition digital motion video recording device tailored to market demand. It has a variety of industry-leading features including digital video recording, photo shooting, audio recording, video display and detachable battery, which makes it perfect for vehicle data recording, photo-shooting, outdoor sports, home security, deep-water probing, etc. Besides, you can control the camera remotely with your iPhone or Android device through the WIFI connection. It'll be excellent indeed on your holiday! a. 1.5" Inch Full Color LCD Display---Higher Light Transmission and More Realistic Color. It is available for video recording, photo shooting and watching simultaneously. b. 170°Wide-angle Lens---Its image is wider & the scene is more real and natural. The wonderful pictures are all captured, even for those corners which human eyes cannot see clearly. c. H.264 Full HD 1080P--High definition screen that displays and records fascinating videos recorded. d. Built-in anti-shaking function, perfect for catching every touching moment. f. Video Encryption Enabled Function. g. Support Storage Cards Up to 32GB Maximum— there is more space to record more wonderful moments. h. Wi-Fi Remote Control—supports Android and IOS. It can make camera and smart device synchronize in real–time. i. 12.0 Megapixels—It has12Mega Pixels CMOS-Sensor and makes image clearer and more vivid. j. 30-meters Waterproof--A water-resistant casing that allows you to film fascinating water sports; water-resistant up to 30 meters under water. k.Multi-mode Camera---Itcan be used for motorcycle, skating, climbing, diving, bicycle, mountain bike and so on. l. Loop recording Function---When the recording time exceeds the setting recording time, the latest video segment will cover the earliest segment. m. Rechargeable and Detachable 900mAh Lithium Battery---that is easy to replace and prolongs your camera’s service life. It can last more than 70mins. n. HDMI TV Output—It only needs a HDMI cable you can share your wonderful experience in a bigger screen at any time. o. Optional Accessories—Easy to carry and install, so it can be placed at anywhere to free your hand. p. Multiple Video Recording Format. q. Recorded in MOV Format. s. Smaller, Lighter, Mightier---Used with various accessories combined and free your hands to enjoy the pleasure of outdoor sports. 1. Do not expose the unit to strong magnetic objects, such as magnet and electrical motor. 2. In the case of overheating, smoke, or unpleasant smell in the process of charging, unplug your device immediately to prevent fire hazard. 3. The SD card which show in the picture is not included in the package. If you want to buy, please feel free to contact us. 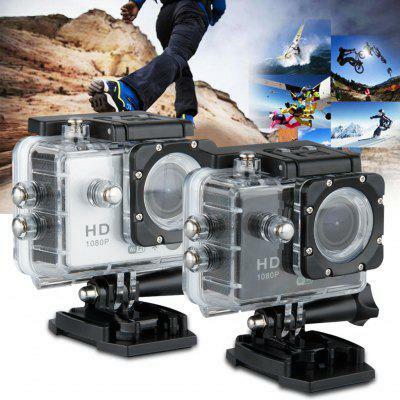 Want to be notified when the DV603E HD H264 1080P Action Sports Camera gets even cheaper? Make sure you snag the best price by entering your email below. We'll email you when the price drops, free! We're tracking the price of the DV603E HD H264 1080P Action Sports Camera every day so you know if that deal is really a steal! Check back for to check the best price for this product - and whether its current sale price is really the cheapest it's been! No DV603E HD H264 1080P Action Sports Camera coupons found!